Joreg Axemouth meets the Pink Wyrm of Dundun Hall. Violence ensues. I’ve been seeing more and more backlash against supposed “grimdark” fiction as of late (which I still don’t believe is real), and I wonder if there really needs to be a “solution” to it. Why can’t there be uplifting fantasy stories alongside darker ones? Does every story have to be about a soulless mercenary wantonly murdering centaurs in a hallowed wood? Or does every story need to be about generations of forest sprites, each one cuter and smarter than the last? No. Fantasy is a broad genre and can very well fit as much as it wants into it. So violence in fantasy fiction. Why do I think it’s needed? Well, because violence is a part of our lives as humans. I understand that people want to get away from that in fiction because they want escapism, and that’s totally cool. However, I find fantasy fiction I read that avoids violence tends to feel too clean, too sterile. Why focus on nice parts of human nature like love, persistence, and honor and not focus on the bad parts like rage, violence, and misery? I think good fiction explores the full range of emotions possible. One extreme or the other really doesn’t do anything for me. And this so-called grimdark fiction is a lot deeper than people give it credit for. I’m not even sure what books classify as such. If you take Joe Abercrombie, who is one of the poster writers when it comes to people pointing out grimdark, his characters have a lot of depth and range of emotion. They’re not just a bunch of murderers killing for no reason. They all have reasons for their actions. 1. Quests need violence. It’s hard to complete a quest to kill a dragon without, you know, killing the dragon? Even one of the lightest fantasy books of all time The Hobbit had some measure of violence. 2. Wars. So many fantasy stories involve wars between countries, races, etc. Wars cannot be fought without violence (in most cases). I would like to see a fantasy story that tackled a cold war. That would be pretty interesting. 3. Swords, axes, bows, magic? These are all things that hurt people. So, yeah, violence goes hand and hand with these things. Now does every fantasy story need to have extreme levels of gore and torture to be violent? No, of course not. But fantasy fiction and violence go as far back as Beowulf ripping off Grendel’s arm. Again, it doesn’t have to be so grisly, but a touch of violence can definitely help some stories. 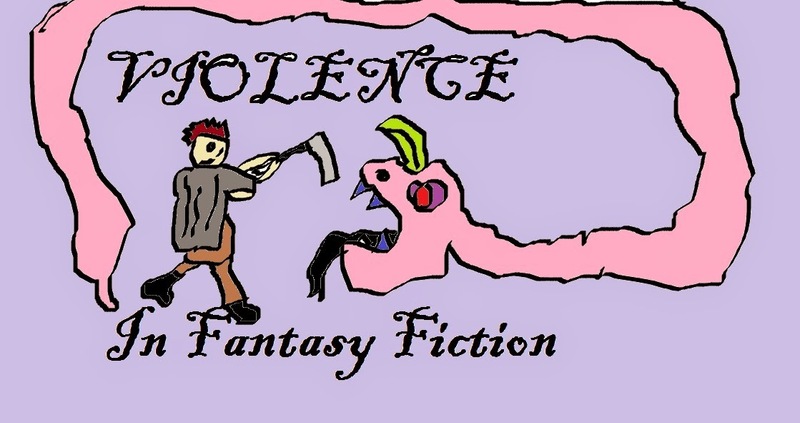 Is that to say every fantasy story needs violence? Again, no. Some might be awkward, like a children’s story about an airship flying cat. It can just be cat that always wanted to fly so he built and airship. Maybe weather plagues him and he almost crashes, but survives and builds it better and faster. No violence and still perfectly fine. But if you’re in the business of writing epic fantasy, you’ll be hard pressed to find one with zero violence in it. What do you think of violence in fantasy? Has it over-saturated everything or is it necessary?